Question: Do you really have to cut your fingernails on the bus? Are you really that strapped for time at home that you grab your nail clipper and say to yourself, “Well, I can always finish clipping my nails on the bus”? I know the bus or train can be boring, and one of the benefits of public transportation is that you don’t have to concentrate on driving, so you can read the paper or a book, listen to music on headphones, eat your Popeye’s and drink your coffee, oh, and/or cut your nails. Don’t you think some people might be grossed out by that? Thankfully, I’ve never seen anyone cut their toenails on Muni, but I don’t doubt I will someday. First the fingernails, then the toes, what’s next? Don’t you see? It’s only a matter of time before someone brings a bucket of water and some shampoo and washes their hair just so they can use their Muni time “productively.” Fingernail clippings have a tendency to shoot in all directions, too. Don’t you know that? I don’t know, it just bugs me. Clip your nails at home, or go to a nail salon. Rob Nagle is a designer and copy editor at the San Francisco Examiner. He clips his nails at home, in his bathroom, over a waist basket, in private. 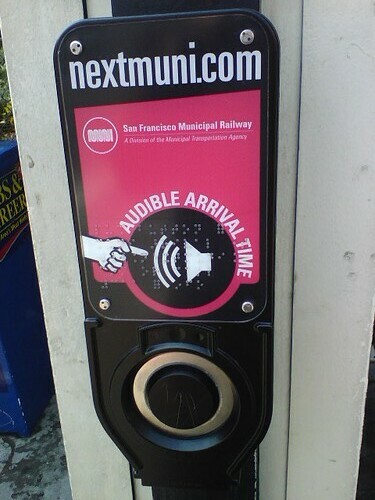 Even though we all know well and good that NextMuni is kind of a joke (as is txtmuni, which completely ignored my cries for help this morning and refused to tell me when my 2-Clement was coming until a half-hour later), I spied this nifty item at the 38/38L stop at Geary and Divisadero Friday, for buses headed downtown. I didn’t push the button, but somebody did, because it kept rattling off arrival times every few minutes and even told us when the bus was actually arriving. Considering that one of my top gripes about Muni is how many buses don’t play the audio signals telling people what the next stop is, this is definitely a step in the right direction. While I’m talking about potentially nifty things, I went to 511’s trip planner Friday and discovered it’s been completely revamped. Now, rather than telling you one route it thinks might suit your needs, it gives you several (it listed four for the trip I needed to make this morning), with descriptions on how long each one will take, how much walking it involves, whether it’s all buses, buses and trolleys, buses and BART, or whatever other combination might work. Of course, it still has the flaw that it’s not connect to NextMuni and has zero clue whether each mode of transit is going to show up on time, but at least someone at 511 figured out that riders might want options — say, to avoid certain routes or certain parts of the city. About time. So I was making my way back to the office yesterday afternoon on the 5-Fulton. Typically, when it reaches its last stop at the Transbay Terminal, the bus driver opens all the doors. This time, the bus driver honked at the 5 in front of him to move forward, but didn’t open the doors. I figured he was waiting to pull all the way forward before letting us off. I, along with the other final passengers, lined up by the back door and waited. And waited. He never opened the doors. “STEP DOWN AND GET OFF THE BUS,” he yelled. I think it was one of the few times in my life that I actually thought to myself, Well, I never! Where do Muni drivers learn their manners, anyway? Now, I know that sometimes — most times I guess — our Muni stories have nothing to do with us, or choices we make. Usually we’re victims of circumstance. But sometimes, we make our own Muni stories. Before I go on, let me preface this with the fact that, rules are rules, and if some rules aren’t enforced by Muni or are just completely ignored by other Muni riders, then those situations where said rules are ignored or unenforced are just reasons to criticize Muni, am I right? Of course I am. So, let’s get to the first two rules, first — no eating. Now, myself, I’m going to have to be pretty motherfucking hungry to even want to eat on Muni in the first place. That’s just me, I guess, because I can’t even count the number of times I’ve been subjected to nasty fast food aromas and the grease said food emanates throughout the tiny confines of your standard-issue Muni coach. Then, of course, there’s the sunflower-seed shells that coat the floor of the bus like so many expended ordnance on the battle field. Let’s not forget the other trash that is left behind that we have to kick under the seat in front of us just so we can be comfortable. OK, so, people eat on the bus, whether I like it or not, whether I do it or not, this happens, it’s against the rules, but I’ve got to live with it.